Laura Cave is the Founder and Director of Just Trade and Chair of BAFTS. She talks to us about how Just Trade got started, the difference between Fair Trade and Fairtrade, the challenges and rewards of running a business that values every person from producer to customer, and exactly how many cups of tea it takes to get through an average working day. Tell us a bit about Just Trade. How did it all begin? What does a typical working day look like? It all began when I visited Peru to volunteer for a Fair Trade jewellery project called Achkiy during my time studying jewellery in the UK. I went back regularly for eight years, and towards the end of that period, started to get involved in a new project called Hope Jewellery, based in Lima. I became friends with the women working in the project and saw great potential in the skills they already had and in their desire to learn more. However, they had no route to market, and so in 1996 I set up Just Trade UK with the primary aim of opening up a viable trade route and providing fairly-paid, flexible work and training for these women. Since then, we've grown considerably; we now work with eight groups of artisans in Peru, Ecuador, India and Vietnam to create beautifully handmade jewellery and accessories using an innovative and collaborative approach. We also create bespoke collections for galleries and organisations, such as architecturally-inspired jewellery for The Tate and crochet poppy brooches for The British Legion. Our UK team are based in Peckham and a typical day might involve working on quality control, packing and processing orders, communicating with our artisans, working on new designs and meeting with a museum buyer to discuss a collaboration—all fuelled by around 100 cups of tea. What principles do you operate the business on? It can be hard for brands to gain ethical certification, can you tell us about some of the challenges faced by brands that are trying to achieve accreditation? As a business working with small artisan groups, Just Trade UK is a member of BAFTS (British Association for Fair Trade Shops and Suppliers), which works with UK-based independent shops and suppliers who partner with disadvantaged producer groups for whom accreditation by the WFTO or the Fairtrade Foundation is inaccessible. BAFTS thus offers a way for them to have their commitment to Fair Trade recognised and enables them to be a part of the wider Fair Trade movement and community. Membership is determined by peer-to-peer assessment which takes place every two years and ensures that members can provide evidence of their fulfilment of the 10 Principles of Fair Trade. Fair Trade is about compliance with these standards but also a journey of constantly improving and setting goals to push the impact of Fair Trade further. How can consumers find out more about whether a brand with no formal accreditation is truly ethical and sustainable? What things should we look out for? What questions should we ask? A good place to start is with the 10 Principles of Fair Trade highlighted above; how the brand’s values and practices do or don’t match up with those will be a good indicator of their ethical credibility. You could also email or tweet your favourite brands asking Fashion Revolution’s question, “Who made my clothes?”, and calling for greater transparency in the supply chain. It's also worth bearing in mind that simply because a brand is not officially Fairtrade-accredited, that does not mean that they are not adhering to Fair Trade practices. This brings us on to the difference between Fair Trade and Fairtrade (confusing, yep). While Fair Trade deals with the way products are made (i.e. the manufacturing process), Fairtrade is concerned with what the products are made out of (i.e. raw materials or ingredients and how they have been farmed, mined or harvested). This means that the familiar Fairtrade stamp that you might have spotted on a bag of coffee or bunch of bananas can only be applied to raw materials, rather than a manufacturing process. 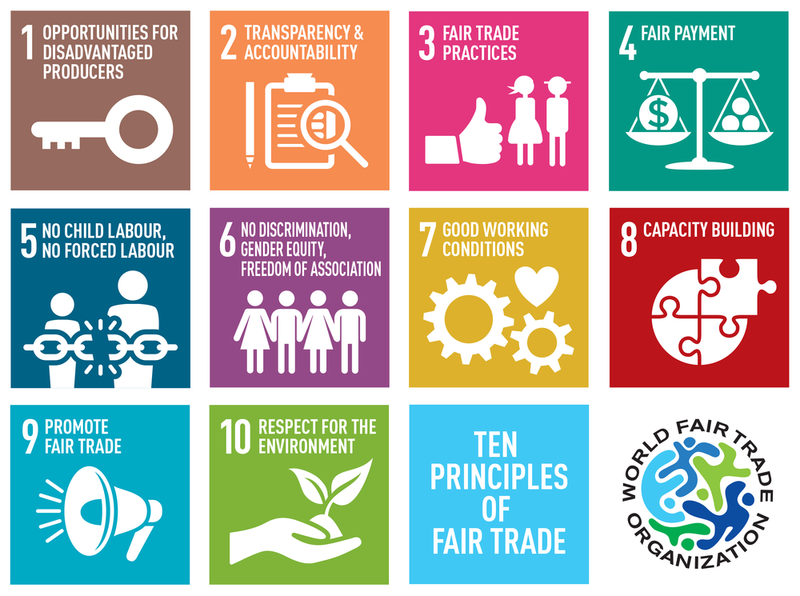 For many businesses, both Fairtrade and Fair Trade-certification are inaccessible for a variety of reasons, but before writing them off as “unethical,” it’s worth reading through the information on their websites, using the 10 Principles of Fair Trade as a barometer of ethical practice to help you make an informed decision. Ethical Consumer is also a really useful resource, as it provides in-depth reviews of the ethics behind every brand, covering everything from washing powder to banks. Their reports are rigorously-researched and offer a really thorough insight into the particulars of each brand, allowing you to search according to your particular ethical priorities, whether that be animal rights or sustainability. What are some of the challenges of running your business? Many of the challenges we face are the same as any small business, such as cash-flow and navigating fluctuations in exchange rates and uncertain economic times. Paired with this, we work with people some of whom live in challenging circumstances and precarious environments. For instance, there was a devastating earthquake which struck Ecuador in 2016 and one of our producer’s in Peru, Betty, needed to raise more than a year’s wages to fund a major operation for her son. All of this means that often well-thought-through planning can get thrown off track by unforeseeable circumstances and pressures outside of anyone’s control. Yet, of course all these challenges are part of the process of running a Fair Trade business, and something that we aim to tackle as best we can to both stick to our Fair Trade principles and maintain a viable business model. Seeing how the work has grown and is benefitting more and more people around the world is definitely the most rewarding aspect. We’re also incredibly proud of the products that we are managing to create and the bespoke collections produced for various museums, galleries and charitable organisations globally. For us, the proudest moments are always when every person in the supply chain—from producer to supplier to customer—feels valued and in return values the care and creativity that goes into every Just Trade product.